A water heater expansion tank is designed to help prevent fluctuations in water pressure and extend the life of a water heater. Fluctuations in water pressure can damage a water heater and water lines in the home’s plumbing system. The water heater expansion tank serves as an overflow receptacle by absorbing excess water volume that the water heater creates when heating water. 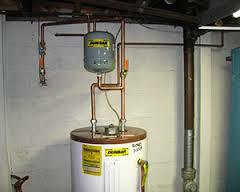 Expansion tanks are normally installed above the water heater on the cold side before the water enters the water heater. Since water expands when it is heated due to thermal expansion, the water heater creates extra water volume every time it heats water. The extra water volume creates excess pressure in the plumbing system and can cause damage to the water heater, fixtures and water piping over time. Extra hot water from the thermal expansion can be stored in the expansion tank and when hot water is demanded, it is put back into the water heater. Having an expansion tank also helps prevent dripping faucets and running toilets by keeping the extra built up pressure from reaching the fixtures and prematurely damaging them. Homes commonly have a closed system which is a water system with a one way valve such as a check valve, a backflow valve or pressure reducing valve. In a closed system, this extra water pressure from thermal expansion can cause the most damage because the extra water pressure has nowhere to go since it cannot push back into the city water. Most cities require that expansion tanks be installed in closed systems. If you have some form of backflow preventer installed on the main water line you may be required to also have a water heater expansion tank installed. You can check local building codes or call the City Planning & Building Department in your area to find out more. If you do not have a one way valve installed on the main water line, and therefore do not have a closed water system, you may still benefit from a water heater expansion tank. If you are hiring a plumber to have a water heater installed it is a good idea to get a price for the installation of an expansion tank also. It may not be much more than you are already paying if it is done at the same time. Consider having an expansion tank even if it is not required since the benefits far outweigh the work and cost involved. For more information or to schedule an installation call ACE HI PLUMBING, HEATING & AIR at 970-667-0300 today. We have trained and experienced technicians who you can trust.